Select what you are most afraid of out of the answers listed below. You have an unexpected day off from work or school. How would you choose to spend it? A strange clown offers you something you've always wanted. You are normally pretty wary of strangers but this person seems alright. How do you handle the situation? You are being held prisoner. Your captorers have said they will never let you out. How do you handle the situation? Scenario: Despite not being a popular student, you just got invited to prom. How do you handle the situation? Go to prom, what could go wrong? How much time do you like to spend alone? What is your attitude towards pets? I love my pets and never want to be without them! Storm clouds are passing overhead. It looks as though it will be a big storm. How do you handle the situation? Be very careful, there is a murderous clown living in the sewer near you. You'd be advised to be greatly cautious and to never engage with the clown known as Pennywise. You are a living character in Stephen King's "Shawshank Redemption". The famous book-turned-movie is also referenced in Castle Rock, King's new TV series along with JJ Abrams. You are living in the book "Carrie". Be careful, or people might dump buckets of pig blood on you. What kind of prank is that anyway? Those kids had it coming if you ask me. All work and no play makes you a pretty dull person. Unfortunately, you are living in the Shining. Your seclusion might be leading you to some hallucinations. On the flip side, there's a cool hedge maze in your yard! Stephen King is actually not a fan of this book, despite having written it himself. He has called it "too bleak". Well, you are living in a world that even Stephen King himself decided was too dark. That must be difficult. On the plus side, your pets will be with you forever! A door to another dimension has been opened and you are about to get sucked in. You are living in Stephen King's "The Mist". There is a chance you are living inside a Stephen King book. The author has actually been so successful and written so many books that most of us are actually just his characters, living in his worlds. 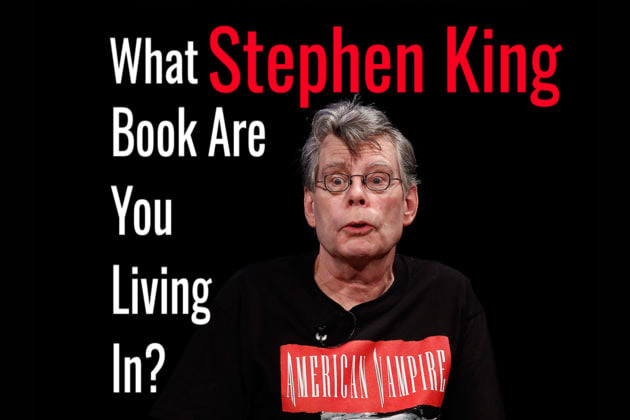 Take this quiz to determine which Stephen King book you are living in.